When choosing a cover design for this wedding photography album, we gave careful consideration to the style of the wedding, the wedding venue, the colors, etc. This was a wedding of some surprising contrasts: It was a relatively intimate black tie Persian wedding at Calamigos Ranch in Malibu, CA. The cover material is a natural colored line which goes nicely with the rustic, natural environment of Calamigos Ranch without going overboard in that direction. 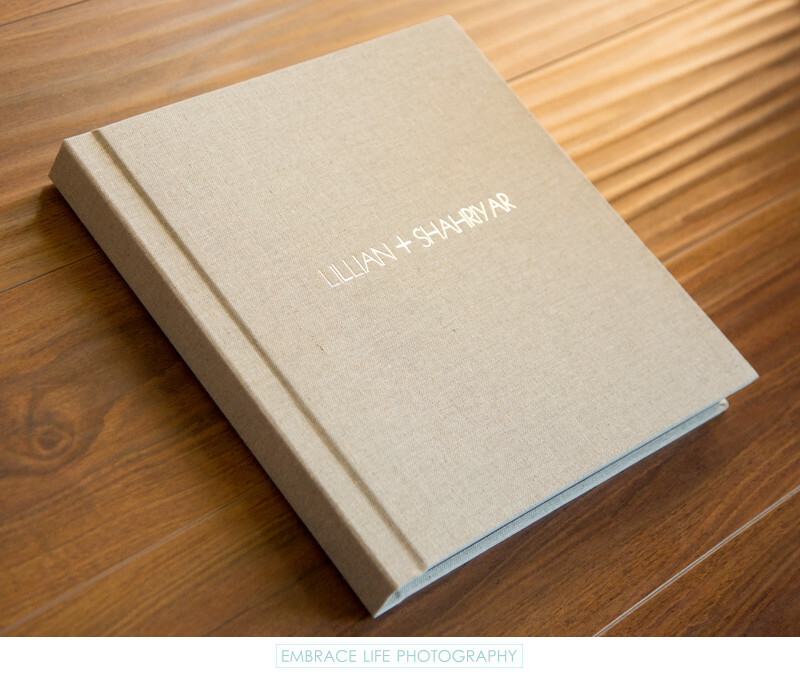 While we often feature photographs on our wedding album covers, sometimes all that's needed is some well placed, well design text, like the all uppercase foil imprinting on this cover. The end result is an overall sophisticated and slightly modern feel that is still true to the uniqueness of this Persian wedding. Location: 327 Latigo Canyon Road, Malibu, CA 90265.